The Central Bank is awaiting the Parliament nod for the 2017 budget to decide on as to how it could implement the proposal to double the minimum capital levels of licensed commercial banks, but the Governor said he welcomed the proposal as it could consolidate the overcrowded banking sector. The budget 2017 proposed to increase the minimum core capital level from the current Rs.10 billion to Rs.20 billion of all licenced commercial banks, but was silent on the timelines of implementation. Many expect the proposal to come into effect from January 1, 2018. “The budget proposals have not been passed yet. 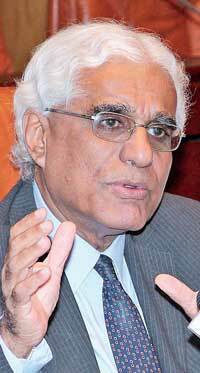 Once they are passed, we will sit with the Finance Ministry and see how things can be implemented”, said Dr. Indrajit Coomaraswamy. Sri Lanka operates with 25 licenced commercial banks— 13 local and 12 foreign— probably too many for a country with a 21 million population. Australia, a country with a similar population, operates with only 4 to 5 banks. “My personal view is that there should be some consolidation of the banking sector given the size of our financial system, the number of banks in my view is too many,” the Governor said. In fact, a lesser number of banks make a regulatory oversight process by the Central Bank much easier and effective. Fitch Ratings recently held the Central Bank partly responsible for some of the undercapitalized small and mid-sized banks in the system as the banking regulator failed to strictly enforce the minimum regulatory capital levels. The rating agency welcomed the budget proposal to increase the minimum capital levels of licenced banks although it remains a question whether the Finance Minister could impose such requirements on banks as the financial system regulation comes under the purview of the Monetary Board of the Central Bank. “So, this is one way in which one can nudge the process of consolidation in an organic way rather than forcing the process through some shot-gun marriages,” Dr. Coomaraswamy said. The previous Mahinda Rajapaksa administration forced the banks and licenced finance companies— through the Central Bank to merge—a move that was halted by the new regime when it came to power in 2015. However, now it appears that even the new administration has found the number of banks and finance companies in the economy a headache. Governor Coomaraswamy is of the belief that the Central Bank should take utmost care in implementing the budget proposals, particularly in deciding the timelines. “I think, it is a positive thing. But we need to be careful about the timelines and how this could be implemented once this budget proposal is passed by the Parliament”, he remarked. Meanwhile, the new rules under the BASEL III framework which are underway also require higher capital buffers in relation to risk weighted assets (or loans and advances) and they look at the leverage ratios of the banks.